Leicester City manager Claude Puel defended Jamie Vardy after the England striker was sent off for a dangerous challenge during Saturday's 2-0 Premier League win against Wolves. Vardy's frustrated lunge midway through the second half forced Matt Doherty off injured, having caught the Wolves defender high with his studs showing. 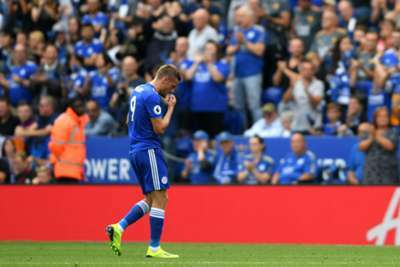 The dismissal had no impact on the result as Leicester held on for the victory, but the Foxes will now be without their main attacking threat for three matches. "I think it perhaps was a little tough, because it was not his intention to make a foul," said Puel. "He touched the ball. After that, he was perhaps too enthusiastic on his move, on his tackle. It's a pity. "I want to support him. 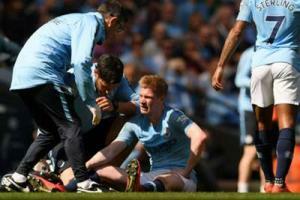 He likes playing all the time, 90 minutes if he can, and we need now to find a solution to replace him and it will be a good opportunity for some other player to show their quality." Leicester were fortunate to come away with the three points, having seen Wolves hit the woodwork twice before Doherty inadvertently opened the scoring by heading into his own net. James Maddison added a deflected second before half-time to give Leicester a cushion. Speaking to BBC Sport, Puel added: "I think this team [Wolves] deserve another result. I don't know if it was a fair result. "But we took an important three points. Congratulations for Wolverhampton because they played very well with style. They are difficult to read. They caused us a lot of difficulties because they open up the lines. It's difficult to defend against this team." Wolves coach Nuno Espirito Santo said: "Of course, we are disappointed, but we have to be clinical. We have talent but we must believe that we can score at every moment, the beginning, middle and end of the game. "We started well, controlled the game, created chances. The 'but' is that we didn't score though, because we had chances. "In football, when you're the team that punishes first, then you can control situations better. We created enough to score goals." Wolves host reigning champions Manchester City next weekend, while the Foxes head to Puel's former club Southampton.